What oppresseth thee so sore? What strange life is o'er me stealing! I acknowledge thee no more. Chain thee with unceasing might? Hold me fast against my will. To her will I must resign me. 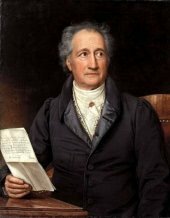 The poem “Neue Liebe, neues Leben“ by Johann Wolfgang Goethe, which was written in 1775, is about Goethe’s love for Lilli Schönemann, who constricts his freedom against his will. The poem consists of three stanzas, each one is composed of eight lines. It is made up of trochees with four stressed syllables. The first four lines are written in tail rhyme (abab), while the others are based on rhyming couplets. The first and third line have got female cadences1 (two stressed syllables), the second and fourth line have got male cadences. 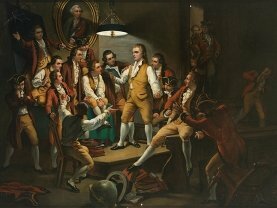 At this point a short digression becomes necessary: Goethe met the banker’s-daughter Lilli Schönemann the first time in Frankfurt in 1775. When they became engaged, he had to face refusals by both families. 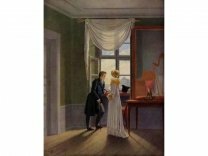 It was a relationship beyond social borders, which soon made Goethe feel restricted. After one year the engagement broke. Line 5 and 7 can be associated to Goethe’s earlier life, which changed completely after his engagement. This engagement to a lady of upper class also explains the for Sturm und Drang rather untypical regularity in rhyme and metre. In the second stanza Goethe still talks to his heart. The verb “fesseln” (line 9) (to snackle) shows that his heart’s bond to the beloved one is overwhelming and superior. Over four lines a rhetorical question is raised asking about the validity of this relationship, which seems to make Goethe feel rather unsatisfied and unhappy. He names several possible reasons for his feelings: “Jugendblüte” (line 9), “liebliche Gestalt” and “Blick voll Treu und Güte” (line 11). These positive descriptions of Lilli are a contrast to the expression “mit unendlicher Gewalt gefesselt” (line 9 and 12) and form an antithesis3. Her flush of youth, her appearance and her glance are personifications4. The anaphora “diese” (line 10f.) stresses his feelings, too. The infinite force with which his heart is bond to Lilli is expressed by means of a hyperbole5. Goethe seems to have no influence on this relationship, he even seems to not agree with it. This hypothesis is also supported by the following lines. In line 13 and 14 he describes how he has tried to stop this relationship. The tricolon “entziehen”, “ermannen”, “entfliehen” (deprive, to take courage, to escape) perfectly highlight this. However, all effort to stop this love makes him return to it: “im Augenblick […] zu ihr zurück” (line 15f.). Goethe’s sigh in line 16 puts emphasis on the impression that he is completely powerless and has no chance to escape. This feeling of non-disengagement is mentioned in the third stanza as well. The alliteration6 “wider Willen” (line 20) shows that all this happens involuntary, it is only hold by a “Zauberfädchen” (line 17) (a magic thread). Now the narrator sees the abilities of Lilli as magic and curse at the same time attributing them to supernatural forces. Her power is only described as a fine and thin thread, which, however, cannot tear. The girl just manages to hold him, an accomplished man. This can only happen by means of supernatural forces as mentioned in line 21: “Zauberkreise”. The expression “muss” (have to) and “auf ihre Weise” (according to her will) stress that the bond between them happens without his agreement. He longs for the good old times, as indicated by the sigh in line 23. The last line consists of an anaphora “Liebe” and a plea: “Lass mich los” (let me go). This plea emphasises Goethe’s feelings and his regrets that he has to adjust himself. Finally, the title of the poem summarises its main subjects. It consists of an anaphora and an alliteration. A new love also brings along a new life. It also requires adjustment. As already mentioned, this poem is untypical for the literary period of ‘Sturm und Drang’. However, some characteristics of it fit into this rebelling period: there are numerous personifications and love is depicted by images of nature (“Jugendblüte” line 9). A great number of dashes, commas, exclamation and question marks make the poem seem alive and dynamic. The predominant egoism is a feature of ‘Sturm und Drang’ poetry, too. Goethe describes his own dilemma, his performance as marionette in the hands of his supernatural beloved without ever mentioning her feelings. The use of female and male cadences emphasises his impression of missing freedom of movement as well. The rhyming couplets in the second and third stanza fit to the use of cadences and to the stanzas’ contents. For the descriptions of his attempts to escape in lines 13 and 14 female cadences are used, the same in lines 21 and 22 when the narrator talks about the “Zauberkreise” that surrounds her. 2 Anaphora: repeating a word or a sequence of words at the beginnings of sentences/verses. Example: Mad world! Mad kings! Mad composition! 3 Antithesis: contrasting two terms or phrases with opposite meanings, typical for the literary period Baroque. 6 Alliteration: repetition of identical or similar sounds at the beginning of a few succeeding word. Example: Peter Piper Picked a Peck of Pickled Peppers.